Sandwiches are one of the most popular midday choices for lunch and, for some, even dinner. They are quick, delicious, and, if properly portioned, an option for losing weight. But if you aren’t careful, a few ingredients can add hundreds of extra calories and make up more than half your daily limit of artery-clogging saturated fat. So make sure you know what hidden calories are hiding between those bread slices. If you make smart choices you’ll create a delicious and healthy sandwich for yourself. Start with whole grain bread slices, a pita, an English muffin or a tortilla. Look for the words “whole grain” near the top of the ingredients list, not just “whole wheat.” Good choices have at least 3 grams of fiber per serving. Some breads are fortified with extra fiber and contain as many as 12 grams of fiber per serving, helping you achieve the recommended 25-30 grams of fiber a day. Good sandwich fillings include chicken, turkey, ham, lean roast beef, tuna, hummus and reduced fat cheese. Check the sodium levels in prepackaged and deli meats, since most of those products run high. Cut the sodium by slicing meat you have roasted at home or by asking specifically for meats lower in sodium at the deli. Vegetables add both nutrients and flavor. Tomatoes, fresh greens (the darker, the better), red onion and peppers are all good choices. Roasted red peppers are especially good and it you like things spicy, sliced banana peppers can do that for you. In a small bowl, whisk together yogurt, dill and lemon juice. Season with 1/8 teaspoon each salt and black pepper; set aside. In a separate small bowl, whisk together egg whites, Dijon mustard and remaining 1/8 teaspoon each salt and black pepper; set aside. Place panko crumbs in a shallow pan. Place flour in a second shallow pan. Dredge each chicken breast in flour, shaking off excess, then in egg white mixture. Press cutlets gently into the panko crumbs and transfer to a baking tray or plate. Heat oil in a nonstick skillet on medium-high and saute chicken until golden brown and fully cooked, about 3 to 4 minutes per side. Transfer to a paper towel–lined plate. Split buns and spread yogurt-lemon mixture evenly onto cut sides of the bread, dividing evenly between the four sandwiches. Layer the bottom half of each bun with 1 chicken cutlet and even amounts of lettuce, cucumber slices and roasted peppers. Cover each with the top half of a the bun. Spread one ounce of cream cheese evenly on one side of each flatbread. Top with shredded lettuce. Add salmon strips, radish slices and capers to each sandwich; sprinkle with pepper. Fold in half and serve. Preheat the oven to 425°F. Coat a small baking sheet with cooking spray. Slice the top third off the pitas. Tear 2 of the tops into small pieces with your fingers and place the pieces in a small bowl; save the remaining 2 pita tops for another use. Add the milk to the bowl and let the bread soak until very soft, about 15 minutes. Combine the beef, onion, oregano, cayenne pepper, black pepper and salt in a medium bowl. With your hands, gently squeeze excess milk from the pita tops; add the bread to the bowl with the meat; discard the milk. Mix with your hands or a rubber spatula until well combined and form the mixture into 16 balls, each about the size of a ping-pong ball. Place on the prepared baking sheet and bake, turning the meatballs over halfway through baking, until browned and cooked through, 10 to 12 minutes. Combine the yogurt, feta cheese, garlic, cucumber and lemon juice in a small bowl. Fill each pita with tomato, lettuce and 4 meatballs. Spoon yogurt sauce on top and serve. Coat one side of each bread slice with olive oil cooking spray. Place bread slices on a work surface, coated sides down. Arrange tomatoes, mozzarella cheese and basil on four of the bread slices. Cover with the remaining four bread slices, coated sides up; press together gently. Preheat a panini grill or heat a large skillet over medium heat. Add sandwiches to the hot panini grill or skillet; cook for 3 to 4 minutes or until golden brown and the cheese is beginning to melt, turning once if using a skillet. Serve with balsamic vinegar for a dipping sauce. In a large skillet cook ground lamb or beef over medium heat until the meat is brown using a wooden spoon to break up the meat as it cooks. Drain off the fat and place the meat on a paper towel lined plate. Wipe out the pan and add the olive oil, onion and garlic. Cook over medium heat until softened. Add the browned meat, beans, tomatoes, wine, bay leaf, oregano, mint, salt, thyme and marjoram. Cover and cook on low-heat for 45 minutes. Remove the cover and simmer for an additional 15 minutes. Remove and discard bay leaf. To serve: spoon the sloppy joe mixture into the pita bread halves and add the toppings. Some days are so busy that there doesn’t seem to be much time left at the end of the day to prepare dinner. If you keep the ingredients for some quick cooking recipes on hand, you will be able to put a healthy meal on the table without a lot of preparation or long cooking times. So much better for the family than fast food. Stock your pantry with quick cooking rice, couscous, thin spaghetti and orzo. Broths and canned tomatoes are very useful, as are dried seasonings. Keep packages of thin chicken cutlets, lean ground beef, salmon and pizza dough in the freezer and you have the ingredients for an easy meal. Serve with Zucchini and Quick Cooking Brown Rice. This is an easy meal for two and the recipe can easily be doubled. Season the chicken with salt and pepper. Place the flour in a bowl and the beaten in another bowl. Heat the oil and one tablespoon of butter in a large non stick pan over medium heat. Lightly flour chicken, then dip in the egg and add to the hot pan. Saute chicken 2-3 minutes on each side. When cooked, transfer onto a plate. Place the chicken broth in the bowl with the remaining flour and whisk. Add to the pan along with the lemon juice, parsley and remaining butter and simmer on low heat for about 2 minutes so it reduces slightly and thickens. Turn off the heat. Return the chicken to the pan to combine with the sauce and serve. Pat salmon dry with paper towels and season with pepper. In a large ovenproof sauté pan with a cover, heat oil on medium-high. Add salmon and sear for 3 minutes per side, until lightly golden. Transfer salmon to a plate and keep warm. Reduce the heat to medium and add 1/4 cup clam broth to the pan. Add leek and cook for 2 minutes, stirring, until liquid evaporates and leeks soften. Add remaining 3/4 cup broth and broccoli; mix well. Return salmon to center of the pan, nestling the fish between leeks and broccoli. Drizzle half of the lemon juice over salmon; cover the pan and transfer to the oven. Cook for 12 to 14 minutes, until salmon and broccoli are tender. Remove pan from the oven and, using a slotted spoon, transfer salmon and vegetables to a platter; cover with foil to keep warm. Reserve 1/2 cup of the pan juices. In a small bowl, combine yogurt, tarragon, mint, remaining half of lemon juice and reserved 1/2 cup pan juices; mix well. (Add more lemon juice or pan juices as needed to reach desired consistency.) Season with salt and additional pepper. To serve, cut the salmon fillets in half and plate each with lemon-herb sauce and leek-broccoli mixture. Mist a large pot or saucepan with olive oil cooking spray and heat to medium-high. Add sausage and cook, stirring and crumbling with a spatula, until no longer pink, about 3 minutes. Transfer to a small bowl and set aside. Add spaghetti and pepper flakes. When the liquid returns to a boil, reduce heat to medium-low, cover and simmer, stirring frequently, until the spaghetti is just short of al dente, 11 to 14 minutes. Stir in spinach and simmer, uncovered, until spinach is wilted, most of the liquid is absorbed and the spaghetti is al dente, 2 to 4 minutes. Add lemon zest, black pepper and sausage and stir until heated through, 30 seconds to 1 minute. Divide among plates and top evenly with cheese. Line a baking sheet with foil and arrange an ovenproof wire rack over the top. Mist rack with cooking spray. In a small bowl, stir yogurt, lemon juice and tahini until well combined. (If the tahini is hard or lumpy, microwave for 20 to 30 seconds, or until smooth.) Set aside while the kebabs cook. Arrange an oven rack 5 to 6 inches from the top heat source and preheat the broiler to high. Line a baking sheet with foil and arrange an ovenproof wire rack over the top. Mist rack with cooking spray. Arrange an oven rack 5 to 6 inches from the top heat source and preheat the broiler to high. In a large bowl combine sirloin, garlic, onion, cumin, coriander, ¼ teaspoon each black pepper, salt and cayenne. Stir gently until thoroughly combined. Divide mixture into 4 equal portions. Shape each portion into a narrow, oblong 2- to 3-inch-long patty. Mold 2 patties around 1 skewer about 1 inch apart (see photo). Repeat with remaining 2 patties and skewer. Transfer to the prepared rack and broil until tops are lightly browned, 3 to 4 minutes. Turn and broil until lightly browned and cooked through, 3 to 4 more minutes. Divide couscous between two serving plates and top each serving with 1 beef skewer. Serve with tahini sauce and tomato wedges, dividing evenly. Heat oil in a Dutch oven over medium heat and add onion and celery; cook, stirring occasionally, until softened, about 4 minutes. Add garlic and thyme cook, stirring, until fragrant, about 10 seconds. Stir in canned tomatoes and broth; bring to a low boil over high heat. Reduce heat to a simmer and cook for 10 minutes. Stir in half-and-half, salt and pepper. Serve with the wrap or a grilled cheese sandwich. In a 10-inch skillet heat olive oil over medium heat. Beat eggs and pesto together with a fork in a medium bowl. Pour into the skillet. As eggs start to set, lift the edges with a spatula, allowing uncooked eggs to flow to the bottom of the skillet. Cook until the eggs are set but still moist. Sprinkle with feta; cover the pan and heat 1 minute longer. Cut omelet in half. Immediately, place half of the omelet on one flat bread. Top with half the spinach leaves and half the roasted red peppers and roll up tightly. Wrap in parchment and let rest about 10 minutes so the vegetables can warm up. Repeat with the second flat bread and the remaining ingredients. Serve with a bowl of soup. 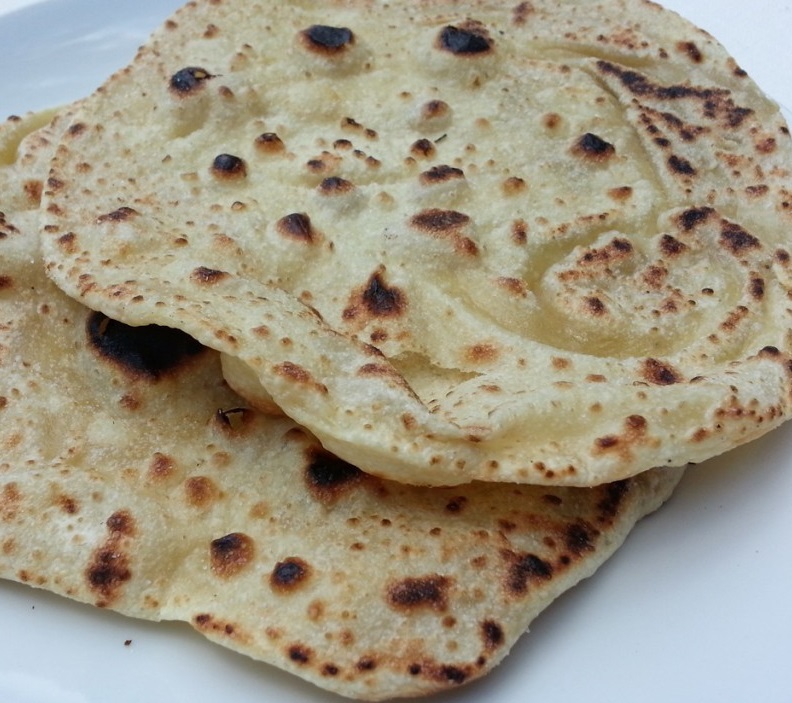 Flatbreads are breads made with flour, water and salt that are rolled into a flattened dough and baked. 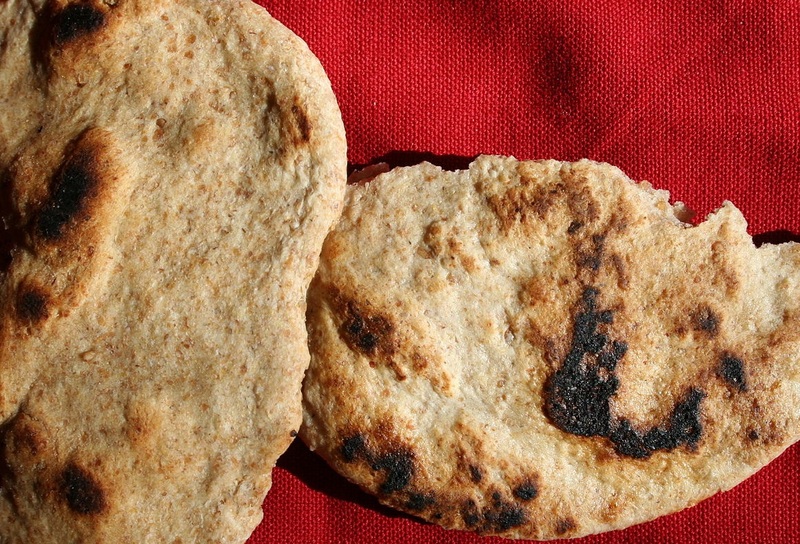 Many flatbreads are unleavened—made without yeast—although some are slightly leavened, such as pita bread. Flatbread became known in Ancient Egypt and Sumer in ancient Mesopotamia (modern-day Iraq), when the Sumerians discovered that edible grains could be mashed into a paste and then baked/hardened into a flatbread. 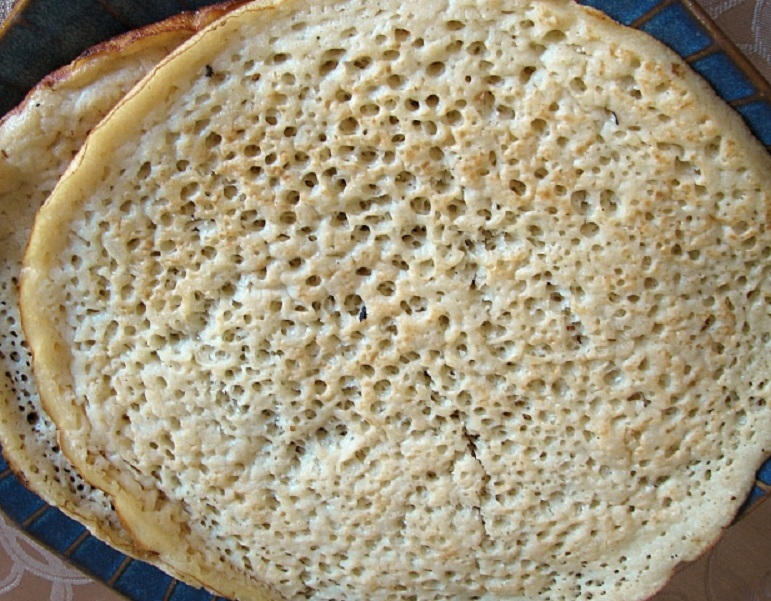 Unleavened breads (such as matzoh which is not prepared with leavening) are usually flatbreads that hold special religious significance in Judaism and Christianity. Flatbreads may contain such ingredients as curry powder, diced jalapenos, chili powder or black pepper. Olive oil or sesame oil may be added, as well, and flatbreads are usually thin. Cheese and tomato sauce are not usually added to flatbread. Pizza, on the other hand, is usually made from dough containing yeast that is topped with cheese, tomato sauce, meats and vegetables. The crust is usually thin and most of the surface is covered with the toppings. 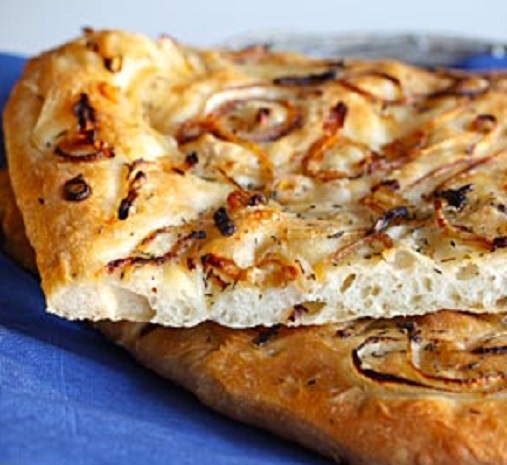 Focaccia is popular in Italy and is usually seasoned with olive oil, salt, sometimes herbs and may at times be topped with onion, Focaccia can be used as the bread to accompany a meal. The primary difference between conventional pizza and focaccia is that pizza dough uses very little leavening (baker’s yeast), resulting in a very thin, flat and flexible crust, while focaccia dough uses more leavening, causing the dough to rise significantly higher. 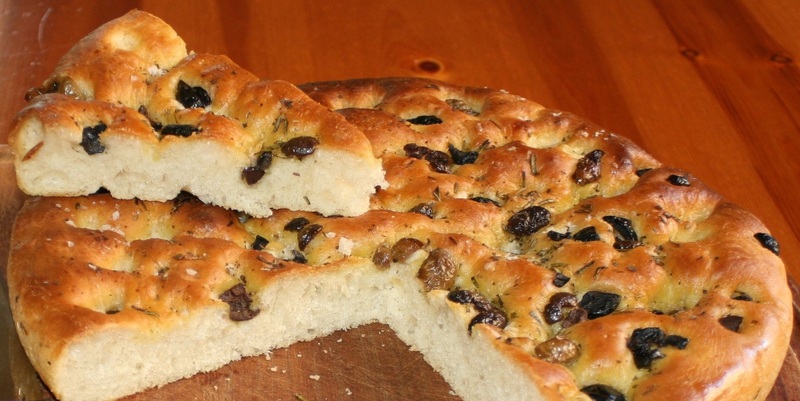 The added leavening firms the crust and gives focaccia the capacity to absorb large amounts of olive oil. Mix the flour and 1/2 teaspoon of the salt in a medium bowl. Add 2 tablespoons of the olive oil. Mix well. Pour in the water and mix until the ingredients come together to form a dough. Add a little more water if the dough is dry and a little more flour if the dough is sticky. Turn the dough out onto a counter and knead for 5 minutes, or until smooth and elastic. Place the dough on a lightly floured counter, dust with flour and cover with plastic wrap. Let rest 30 minutes at room temperature. Cut 2 sheets of parchment paper into 14-inch lengths. Lightly brush the parchment paper with olive oil. Cut the dough into 2 pieces. Place a piece of dough on each piece of parchment paper. Brush the top of each piece of dough with 1 teaspoon of olive oil. Using your hands, flatten and stretch the dough until it thins out to about 10 inches. If it shrinks back, just wait 10 minutes for the gluten to relax. Turn the dough over and brush the top of each with 1 teaspoon olive oil. Turn again and stretch into a 12-inch circle, or until the dough is very thin but not yet transparent, about 1/8-inch thick and even in thickness if possible. Season each dough circle with the remaining salt. Heat a large nonstick 12-inch skillet over medium high heat for 2 minutes and carefully transfer one dough circle to the skillet and cook 3 minutes, or until browned lightly on the bottom. Turn and cook the second side until it also begins to brown in spots, about 2 minutes. Remove to a plate and repeat with the second dough circle. Serve hot, warm, or at room temperature with salami, cheese, peppery extra-virgin olive oil and ripe tomatoes. Prepare pizza dough as directed in the recipe below. About 2 hours before baking, remove chilled dough from refrigerator. Let stand at room temperature to proof. Oil a 14-16 inch pizza pan. Place one ball of dough in the pan and stretch the dough to fit the pan. 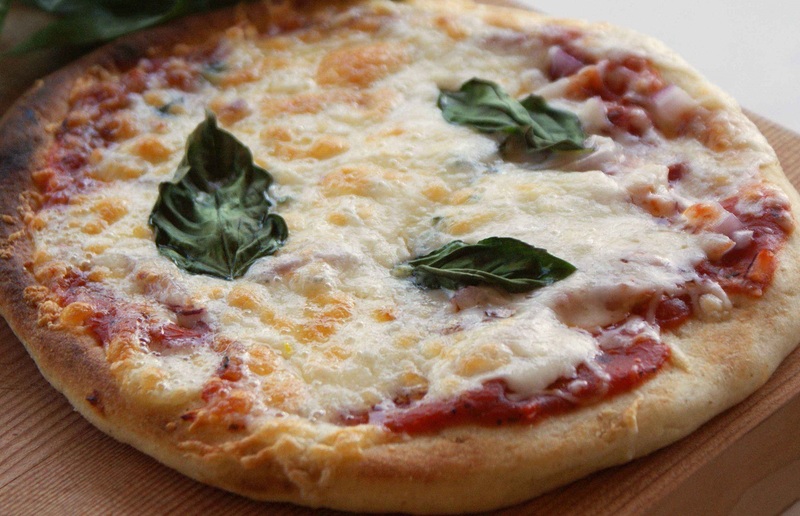 Top the dough with All-Purpose Pizza Sauce, mozzarella cheese, Parmesan cheese and several basil leaves brushed with olive oil. Place the pizza on the bottom rack of the oven and bake for about 15 minutes or until toppings are bubbly, cheese is turning golden, and edges of pizza are golden brown. In the bowl of an electric mixer fitted with the dough hook or in a large bowl using a large spoon, combine all ingredients except olive oil cooking spray. Mix on low or by hand about 3 minutes, until ingredients are combined and all the flour is moistened. Dough will be soft. If using an electric mixer, increase speed to medium; mix 2 minutes longer. If working by hand, continue mixing with the spoon; or turn dough out onto a counter and knead. Mix long enough to form a smooth, supple dough, about 3 minutes. If dough seems very stiff, incorporate more water, 1 teaspoon at a time, as you mix. If dough is wet and sticky, sprinkle in more flour as you mix. Dough should be tacky but not sticky. Lightly coat an 8-quart bowl with cooking spray or oil. Form dough in a smooth ball and place in the bowl, turning once to coat surface with oil. Cover the bowl with plastic wrap, without letting wrap touch surface of dough. Let dough stand at room temperature for 30 minutes. Two hours before assembling the pizzas, remove chilled dough from refrigerator. Mist a large baking sheet with olive oil cooking spray or lightly rub with olive oil. Cut dough in three portions. Form each portion in a smooth round ball. Place each ball of dough on prepared baking sheet. Lightly mist with cooking spray, then lightly cover with plastic wrap. Let dough stand to come to room temperature. In a medium bowl whisk together all ingredients. Taste and adjust the salt, if needed. In a large bowl, mix 1/2 cup warm (105 to 115°F) water with honey. Sprinkle with yeast and set aside to let stand for 5 minutes, or until foamy. Stir in flour, 1 1/2 teaspoons of the salt, 1/4 cup of the oil and 1 cup warm water, then transfer the dough to a lightly floured surface. Knead until smooth and elastic. Transfer dough to a lightly oiled large bowl, turning the dough to coat. Cover and let stand in a warm draft-free spot until doubled in bulk, about 1 hour. Meanwhile, heat remaining 1 tablespoon oil over medium heat in a large skillet. Add onions and remaining 1 teaspoon salt and reduce heat to low. Cook, stirring frequently, for 1 hour or until onions are very soft and golden brown. Set aside to let cool. Punch down dough, then transfer to a lightly oiled 15-inch x 11-inch jelly roll pan or large baking sheet and pat dough out to the edges of the pan. Cover and let stand 45 minutes, or until puffed and well risen. Spread onions over the dough, then cover and let rise again for 30 minutes. Preheat the oven to 425°F. Uncover dough and bake on the lowest oven rack for 25 minutes, or until crust is golden brown and crisp. Cut into pieces and serve. Away from the rolling hills, sweeping vineyards and expanses of the sunflower fields inland, on the Tuscany coast facing Elba Island where Napoleon Bonaparte spent his time in exile, perched high above the Baratti Gulf is the walled town of Populonia. The Populonia Bay is one of the most beautiful landscapes in Italy, a perfect fusion of nature and history. The Baratti Gulf and the Populonia cape have always attracted inhabitants. Today this area is the site of the Archaeological Park of Baratti and Populonia (close to Piombino, in the Livorno Province). The town sits next to the archeological park which contains the remains of a huge Etruscan settlement. The park tells the story of the Etruscans, a group of people who had an important impact on this territory. Populonia is especially known for the wealth of Etruscan archaeology in the area and an impressive collection of artifacts unearthed from the surrounding area, from tools to helmets, weapons, casks and jewellery. Positioned on the summit of a hill for safety reasons, the Etruscans constructed a necropolis at the base to house their dead dating from the late Iron Age (600 BC). Populonia, the only Etruscan town built over the sea, was composed of two different parts: Populonia Akron, the acropolis, the upper part, where there were the temples and the public buildings. Populonia Polis, the lower part, situated close to the Baratti Gulf contained the port, where the main economic and artisanal activities took place. The Etruscans were very enterprising and traded with many people from the East. Iron-work was the main economic activity of the Etruscan and Roman civilizations. This region also contained other precious metals, like copper. 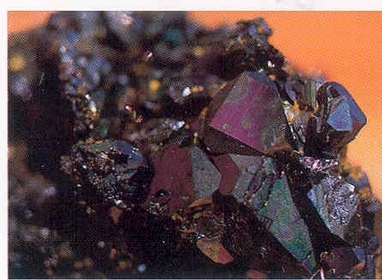 The Etruscans would sail from the Baratti Gulf to Elba Island, where they would transform the hematite into iron. Because of the region’s economic prosperity immigration increased: people from Spain, Sardinia, Campania and Corsica came to Populonia hoping for a new life. The Etruscans also created a mint: they needed coin for their commercial exchanges and to pay the soldiers who were protecting the area. The coins were made in silver and bronze. Many archaeologists tried to discover the remnants of the Etruscan civilization, but they couldn’t succeed due to the terrain. 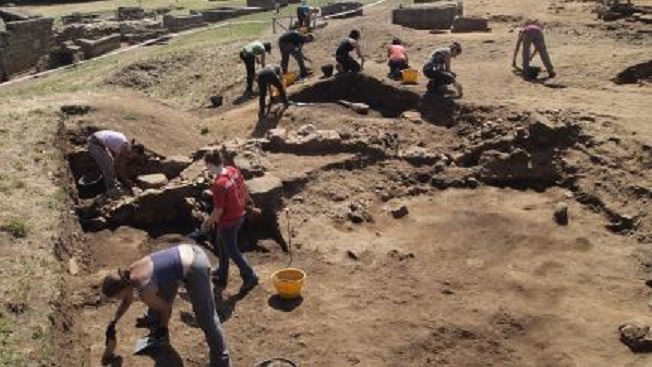 The first discoveries were objects found in fishermen nets and at grave sites The Archaeological Park stretches over almost 200 acres between the slopes of the Piombino Mountains and the Gulf of Baratti. 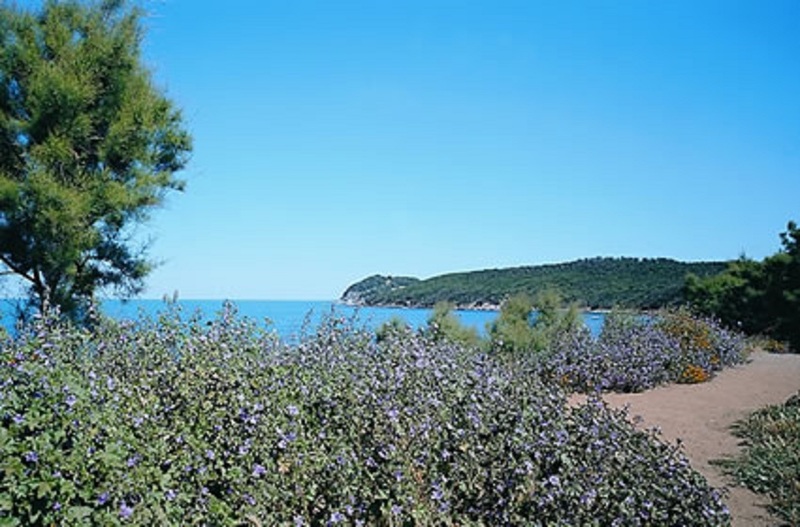 The Park includes a significant part of the ancient town of Populonia and is spread over a vast area, which enables visitors to appreciate the transformation that has taken place over the centuries. The wooded coast overlooks the archipelago and the silhouettes of the islands, including Elba and Corsica, create a picturesque scenes. This is the landscape of the 8th-9th Century B.C., when important houses were built on the Acropolis to accommodate the aristocracies of Populonia. 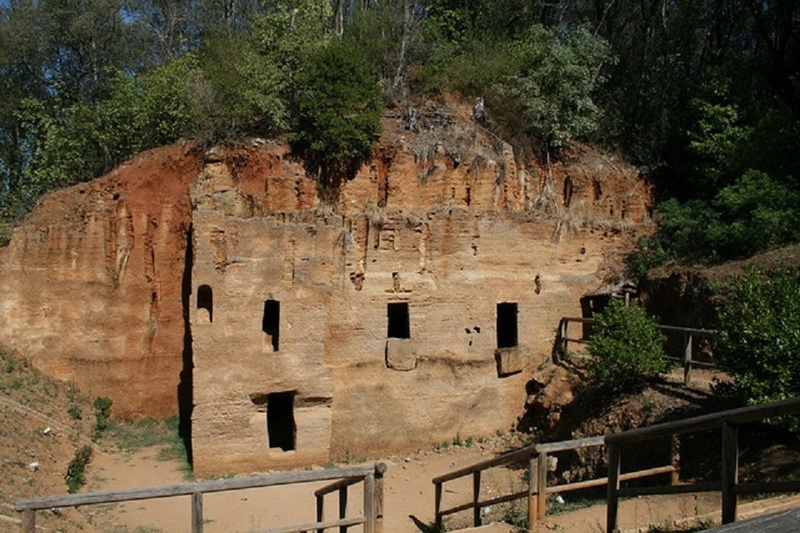 These houses are the remains of the summit of the acropolis and from the beach area on the Gulf of Baratti, one can view the remains of Populonia. A network of roads join the houses and temples to the industrial city and the cemeteries which lie on the first hills surrounding the inlet. As in ancient times, the routes follow the original roads, crossing the woods and the scrub areas and opening up to unexpected views over the Gulf of Baratti and the open sea. The deep wooded areas contain the remains of the Benedictine monastery of San Quirico that tell of a lost city and the natural resources and minerals that were once part of the region. Inside the park one can walk along three paths: the “Iron Route”, the “Quarries Route” and a naturalistic path. The “Iron Route” goes through the areas where the Etruscan ovens used to be. Then, going up the hills, the ruins of the industrial district can be seen. 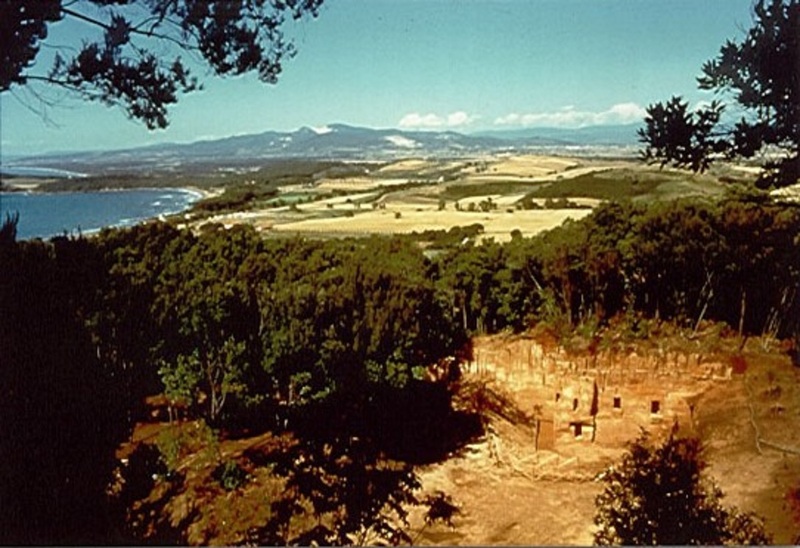 The “Quarries Route” is a path where the Etruscans used to extract the “panchina stone”, that was used to build Populonia. The park also contains an experimental archeological laboratory and a museum that includes vases, precious jewels, bronzes, coins and graphic reconstructions of Etruscan landscapes and activities. 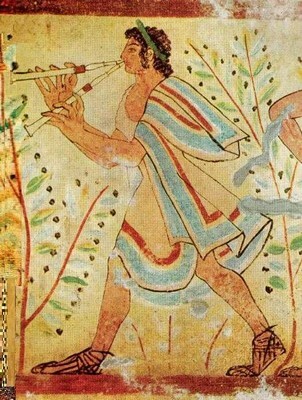 The Italians in Central Italy today are descendants of the Etruscans. Not only that, but the Italian language has its roots in the Etruscan language. The Etruscans revered women, so women and men were on an equal footing. The men were clean-shaven and were primarily sailors and merchants. They were also good sportsmen, warriors and skilled farmers. The Etruscan hillsides were abundant with olive groves and modern potters continue the practice of decorating their ceramics with olives and olive leaves. The Etruscans grew crops beside the grapes and olives and grew barley, millet, broad beans, lentils, chickpeas and spelt. They also grew beans, peas, garlic and onions, figs, melons, apples and berries. They kept livestock, especially pigs, chickens, ducks and goats and hunted game from the surrounding forests, such as rabbits, deer and boar. Fish were taken from the rivers and the seas and they were making pasta with the use of a rolling pin. The Etruscans ate two meals a day, enjoyed holding banquets and made good wine. Their culture and civilization was influenced by the Greek culture and they, in turn, influenced the Roman culture and, in turn, the Tuscan culture, as we know it today. Etruscan food traced from archaeological findings and frescoes depicts food that is still eaten today. They used herbs like rosemary to flavor their meats, honey to sweeten desserts and they had utensils such as saucepans, pans, graters, pots, colanders, goblets and pitchers and beautiful dining plates. They baked and cooked over open fires and produced a variety of breads, one of which is still eaten today – flat grape bread. Wine was plentiful and stored in terracotta jars underground. It was strong and often drunk watered down. Today you will still Italians who drink wine diluted in this way. 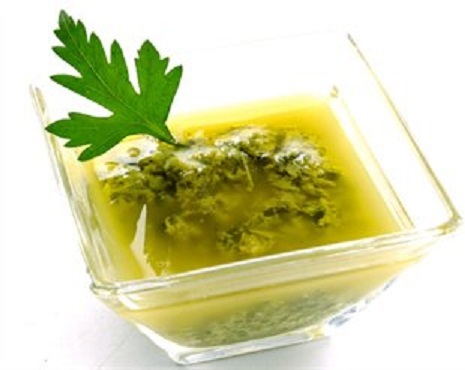 In a large bowl, dissolve the yeast in 1 cup of warm water. When the mixture foams, after 5 minutes, stir in a pinch of salt, 4 tablespoons of the sugar and 4 tablespoons of the olive oil. Stir in enough flour to make a soft dough that is not sticky. On a lightly floured surface, knead the dough for 5-8 minutes until firm, smooth and elastic. Place the dough in an oiled bowl and cover it. Set the dough aside for about an hour to rise in a warm place until it has doubled in size. Preheat the oven to 375 degrees F. Oil a 9×13 baking pan. Transfer the dough to a lightly floured work surface and roll it out into a rectangle, about 1/8 inch thick. Enough dough should hang over the edge of the pan to completely cover the top when folded. Transfer the dough to the baking pan. Spread 3/4 of the grapes over it, drizzle with 2 tablespoons of olive oil and sprinkle with 2 tablespoons of sugar. Fold the overhanging dough up over the grapes, covering them completely. Press lightly to seal. 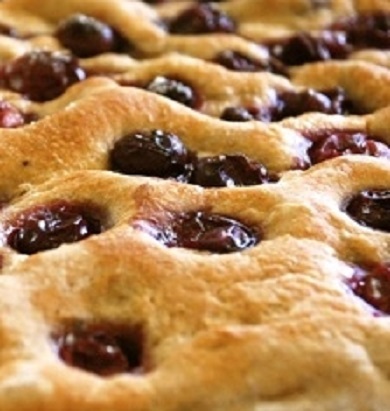 Scatter the remaining grapes over the dough, drizzle with the remaining olive oil and sprinkle with the remaining sugar. Bake the bread until golden brown and the grapes are soft for about 45-60 minutes. Serve hot or at room temperature. This Etruscans served this sauce over what is called bollito misto or mixed boiled meats. 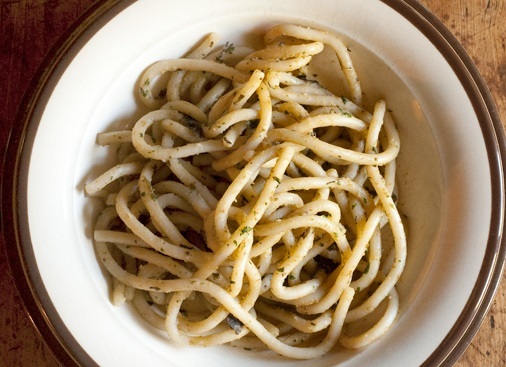 Place it in a bowl – add salt, pepper and start pouring in olive oil until you obtain a creamy sauce. Before using the sauce, let it rest for some time so that all flavors can blend in. Heat olive oil in heavy 4 quart sauce pan. Brown sausage in pan until no longer pink. Add onion and garlic and stir until softened. 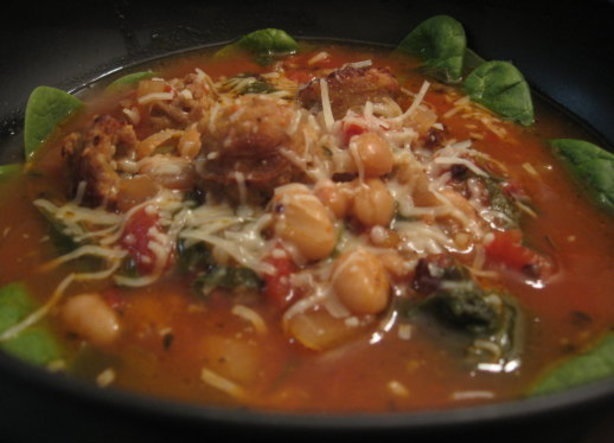 Add spinach, chicken broth, diced tomatoes, beans and red pepper. Heat to a boil and simmer for 15-20 minutes. To make the pasta, mix together the flour, semolina and a pinch of salt in a bowl. Gradually mix in enough water to make a firm, elastic dough. Shape the dough into a ball, wrap in a clean dish towel and let rest for 30 minutes. Meanwhile, make the sauce. Chop the hard-boiled egg with the garlic, parsley, basil and mint, then transfer the mixture to a bowl. Gradually drizzle in enough oil to make a fairly liquid sauce. Unwrap the pasta.Taking a small piece at a time, rub it back and forth on the work surface (counter) with your fingertips until it resembles thick spaghetti. Bring a large pan of salted water to a boil. Add the pasta, bring back to a boil and cook and for 2–3 minutes, until tender but still firm to the bite. Drain, add to the sauce and toss well. Transfer to a serving dish, sprinkle with grated pecorino and serve immediately. Stud the pieces of guinea fowl with the sage and mint sprigs and arrange a pancetta slice over each. Pour 4 tablespoons of the olive oil into a casserole and add the guinea fowl. Roast in the oven for 35 minutes. Meanwhile, heat the remaining oil in a shallow pan with the garlic cloves.When the garlic begins to brown, remove with a slotted spoon and discard. Add the mushrooms, mint leaves and tomatoes to the pan and cook over low heat, stirring occasionally, for 10 minutes. 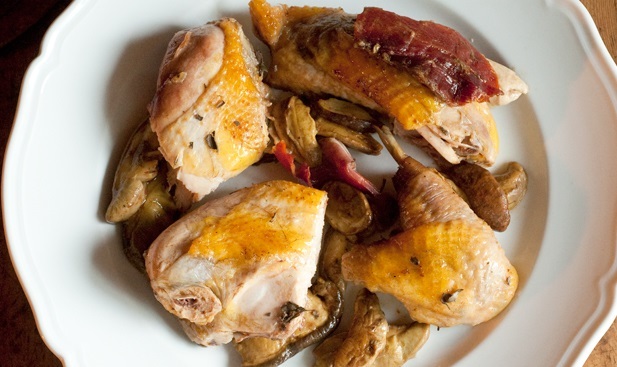 Remove the guinea fowl from the oven, add the pieces to the pan with the mushrooms and cook for 15 minutes. Season with salt and pepper and remove the pan from the heat.